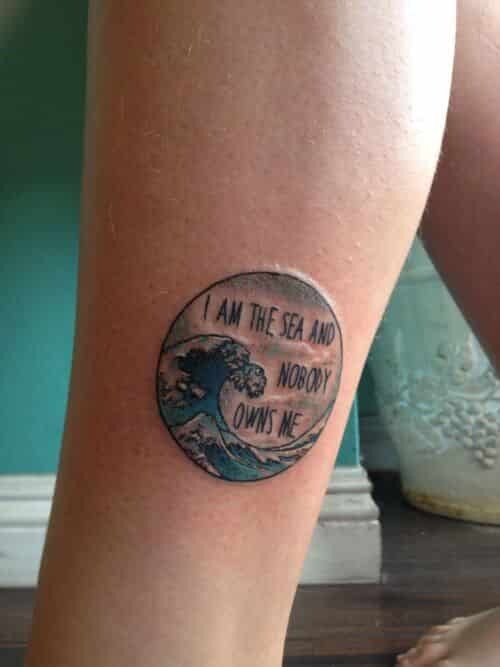 A wave tattoo has the ability to immortalize most, if not all, of your best moments in the ocean. It is also a clear expression of your longing for a life full of endless possibility and freedom. Wave tattoos for men, more specifically, adapt to body curves very easily. They are characteristically visually appealing and highly expressive as well. Every tattoo has a story behind it. That’s what makes it significant and meaningful. Swimmers, surfers, sailors or divers go for wave tattoos to represent a specific moment, person or place in their lives. Most pick a design because of their attractive design. Some are simple, while most are complex. Each has their own meaning. 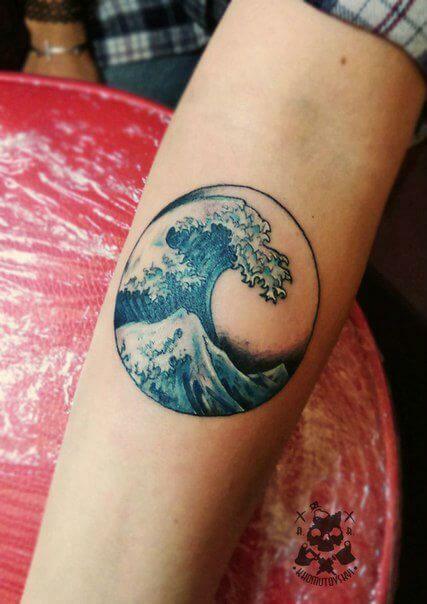 What are the Most Popular Wave Tattoo Designs Available? Turtles, whales, starfish, sharks, fish, and dolphins. These are one of the main inspirations behind men’s wave tattoos. These creatures are artistically placed to represent swirling waters. Wave tattoos could also highlight other creatures, such as snakes or eagles. They could either be in color or plain ink. Most men prefer their tattoos colored, as the vibrant colors make them come alive. The good thing about wave tattoos is that they help showcase a variety of things. Hobbies and sports are no exceptions. Whatever you’re interested in, wave tattoos blend with certain objects of interest e.g diving boards, sandcastles, surfboards etc. These are natural and beautiful extensions of a wave tattoo. Tribal and cultural waves may be used to honor one’s heritage, which could be used as part of a zodiac tattoo. 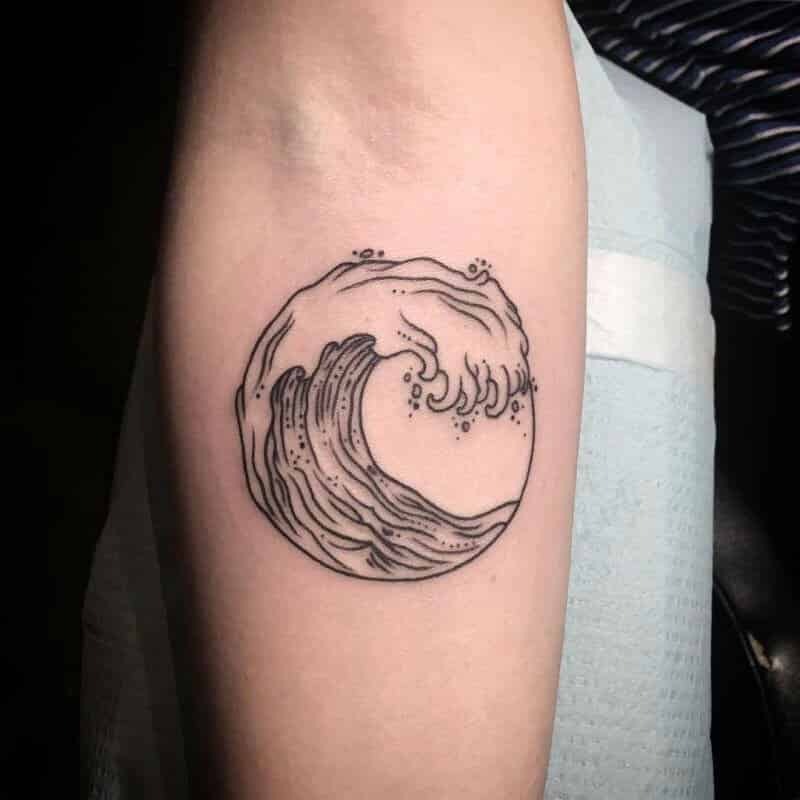 Commonly known as evocative waves, these tattoos have a cultural significance. There is a repetitive pattern in graphic tribal tattoos. Waves often go hand in hand with seafaring objects such as anchors or ships. They act as key elements of tattoo creation. Skull or pirate tattoos tend to have waves around them. More creative is a wave design with a mermaid above it. This is undoubtedly one of the best ways of declaring freedom. Inking waves is pretty much like doing other tattoos. You need to have a choice for the size, ink color and where to place it on your body. Black and blue are a perfect blend for doing these tattoos; they are also the best preference for most men. The size, however, is a personal choice. Most men have varied preferences. A whirling, blue wave which can express strength and greatness. It would be perfectly chosen for a wave tattoo design if they want to be imposing and sublime. Color blue fits nicely with the color white of the foam. 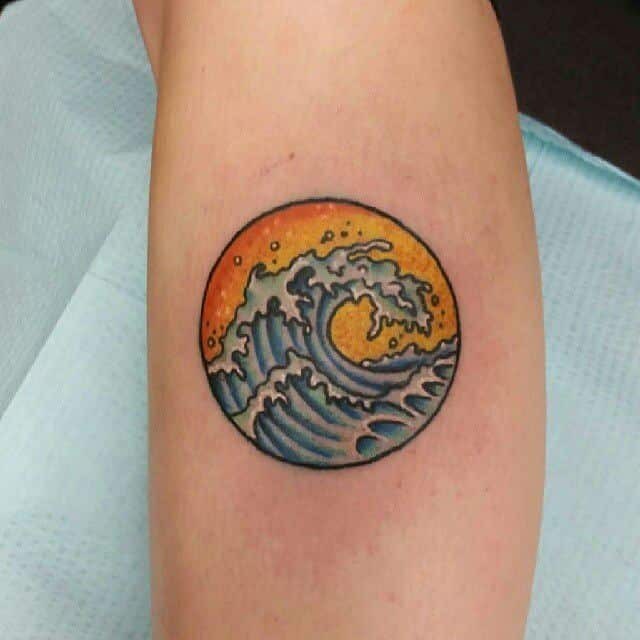 A more simplistic tattoo, but still sublime, also a whirling wave, but this time it’s not blue anymore. 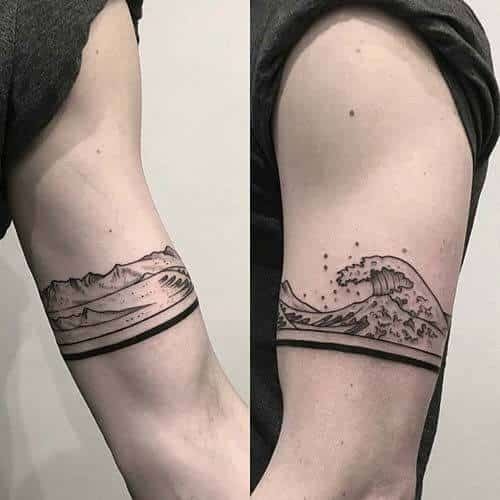 The color black represents mystery and protection, so it is a very unique and creative wave tattoos idea for men who want to be in control. 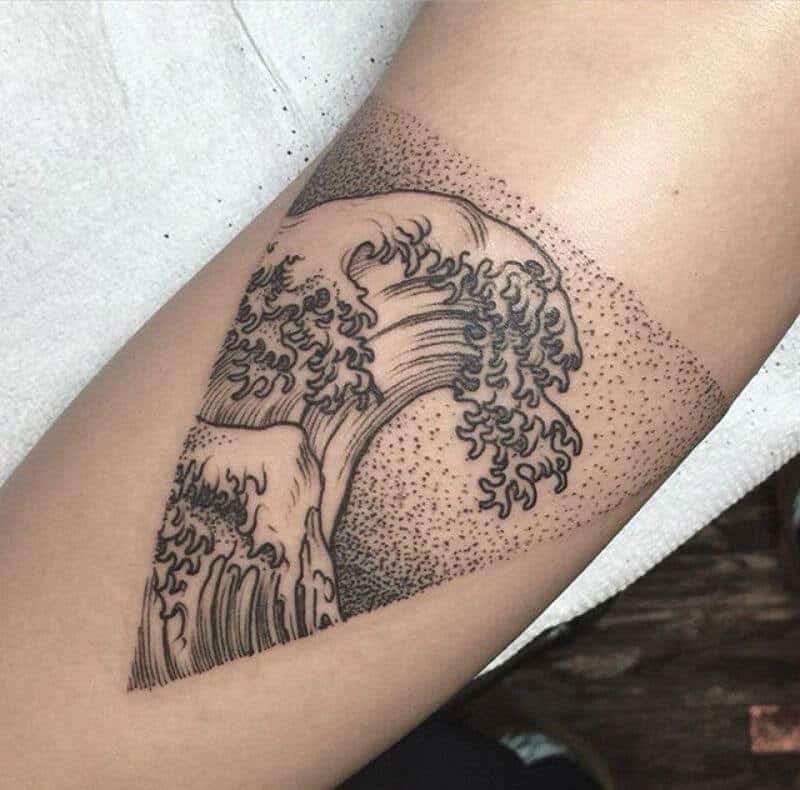 This is a great wave tattoo which fits perfectly on the leg, just like we can see in the picture. The multiple black waves are really intimidating and unfriendly. This tattoo has a nice foam design, very thick, which can lead to a floral design. For this time, the wave is placed in a triangle, which symbolizes the concept of mystic, one of the most suitable wave tattoos for guys. It looks great on the forearms and even on the lower part of the legs. A smaller wave, but much more colorful. The contrast between water and fire, with the orange background, represents the sun. This looks amazing and it represents someone fearless and strong. That orange color, though, looks perfectly combined with the beautiful sea. 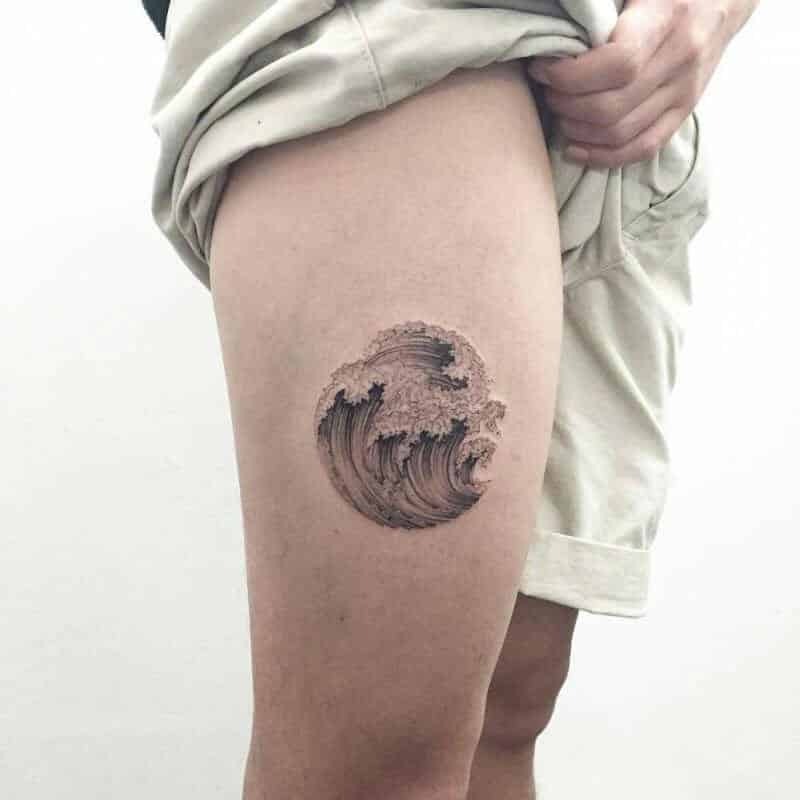 This is one of the greatest tattoo ideas for men, because besides the whirling wave in the blue sea, there is also a message. This message sends the idea of independence and some that has a lot of strength to fight for his freedom. This is the simplest tattoo from this list and it could be more suitable for men who like to get tattoos, but not too visible or too large. If you like simplicity, but you still want to get a tattoo, this is the perfect idea. 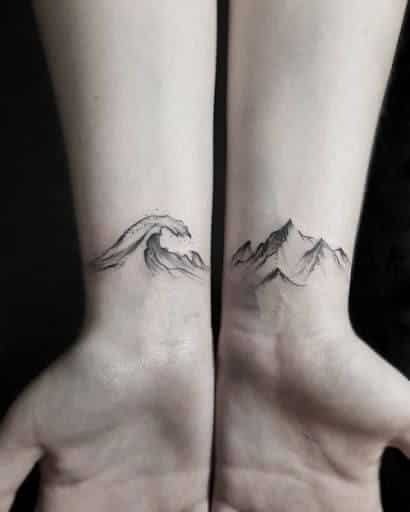 Wave tattoos and mountains are such a dangerous combination and that looks amazing in black. The wave suggests self-control in combination with the mountains which suggest a higher perspective and the ability to see from a loftier point of view. The perfect place for this tattoos is, just like the picture shows, on your wrist. 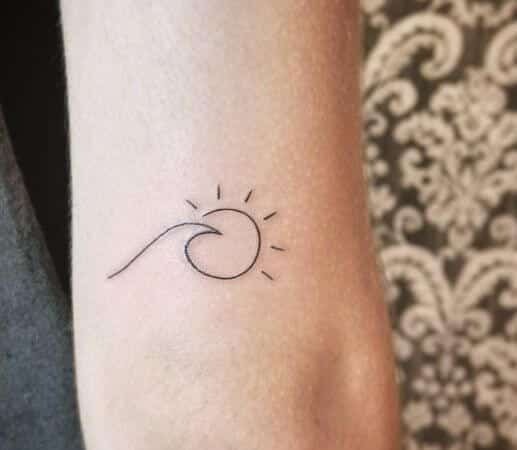 An amazing tattoo, a wave which is drawn all around the hand. It is perfectly done and this kind of tattoo is suitable for men. The lines are drawn thicker and then thinner and the wave is beautifully done. An amazing wave with the most bluish color ever seen. Color blue usually suggests loyalty and honesty, reducing stress and creating a sense of relaxation. 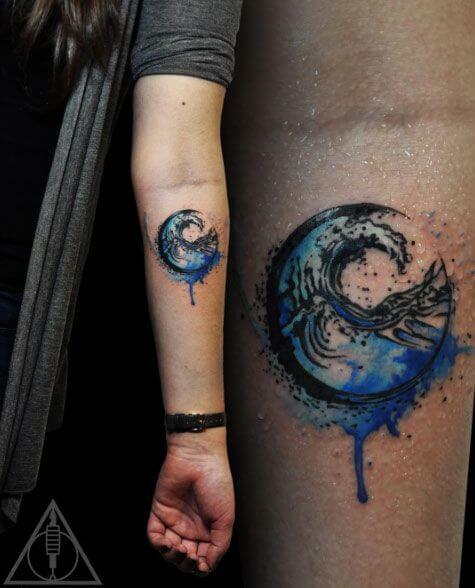 The combination of the wave with this color is one of the tattoos ideas that a men should love.